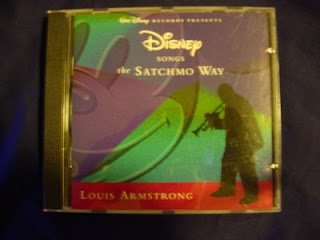 My Magical Collection: Walt Disney Records: "Disney Songs: The Satchmo Way"
Walt Disney Records: "Disney Songs: The Satchmo Way"
This is a Walt Disney Record's release "Disney Songs - The Satchmo Way". It is a compilation of Disney songs performed by the famous trumpet player and Jazz singer, Louis Armstrong. Also known as "Satchmo" since he was a youngster, Louis Armstrong was one of America's premier entertainers. His music and his live performances are legendary. Walt Disney's sense of what the public wanted led him to seek out Louis Armstrong to work on several projects for Disney, including the 1963 TV special, "Disneyland After Dark". The CD featured here is a treat for lovers of Disney music was well as for people who appeciate one of the best performing artists of the 20th century, Louis Armstrong. Some songs featured here are: "Ten Feet Off The Ground", "Chim Chim Cheree", "When You Wish Upon A Star", and "Zip-A-Dee-Doo-Dah". This CD is a must for people who really want to call themselves conoisseurs of Disney music.